Should we pit unbroken forests against renewable energy? If you stood today on sections of Antrim’s Tuttle Hill ridge, you’d hear the wind blowing through the spruce and maples. And as you poke through the trees, you might step over moose and ruffed grouse tracks to get the bobcat’s view of distant hills and ponds. For four years now, we’ve followed the news of a proposed wind energy facility on the ridge between Tuttle Hill and Willard Mountain in Antrim. 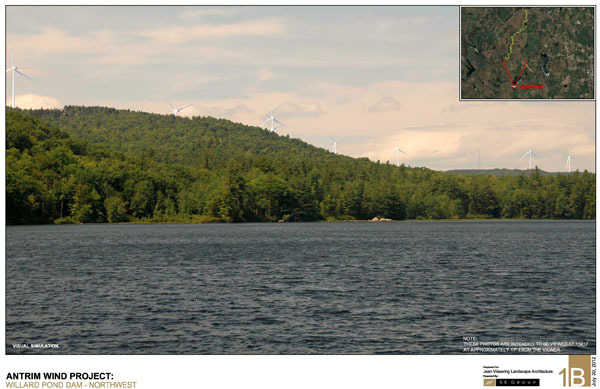 And for the past two years, the N.H. Site Evaluation Committee (SEC) has been reviewing Antrim Wind Energy’s proposal, receiving volumes of testimony from people for and against the plan. When the SEC discusses the project next month, it could make a decision up or down, or opt for more study about the possible impacts of a wind farm on the Tuttle Hill ridgeline. While many folks have had made up their minds on this plan, I’ve had mixed thoughts, seeing both pros and cons. Well, after talking to a lot of folks, touring a fairly new wind farm in Lempster, seeing the Tuttle Hill ridge myself, studying maps, and reviewing the SEC’s lengthy record, I’ve learned a bunch of things and reached a few conclusions. I learned that Antrim Wind Energy (a subsidiary of Eolian Renewable Energy) proposes 10 wind energy turbines nearly 500 feet from ground to top-of-blade running on the Tuttle-Willard ridge in the western and wild part of Antrim. If built, these would be the highest free-standing structures in New Hampshire. The 30-megawatt facility, according to the company, would generate enough electricity to power 13,500 homes. To construct and maintain the turbines, Antrim Wind Energy would build a 4-mile road, starting from Route 9 and running south, climbing Tuttle Hill and following the ridgeline all the way to Willard Mountain. All of this would cross 6 tracts, ranging in size from 110 to 943 acres. And the whole wind facility, in theory, would be decommissioned in 50 years. My quest to understand Antrim Wind Energy’s plan reminded me of my days decades ago, protesting a whacked plan led by Public Service Company of New Hampshire to build a nuclear power plant on the saltmarsh at Seabrook. We knew then that our insatiable appetite for energy shouldn’t be a tradeoff for healthy estuaries, risks of nuclear accidents and (still) unanswered questions about long-toxic waste. We favored renewable energy, holding hands and singing songs about the clean power of the sun and wind. Fast-forward 40 years and we better understand humanity’s legacy of burning fossil fuels since the Industrial Revolution. Our little world is warming. Glaciers are melting. Seas are rising. And our generation owes solutions for the next. Wind and solar energy are part of that solution. How much and where remain to be seen, but definitely a part. And in those decades since Seabrook, we’ve honed our land ethic. We’ve built our knowledge of how wildlife and people depend on healthy lands. We’ve strengthened land trusts and established new ones, conserving precious lands and working with landowners generous and far-sighted enough to protect their tracts with conservation easements. Now, land trusts have protected more than 348,000 acres throughout New Hampshire, mostly through conservation easements. While some of those protected places are hilltops, the Tuttle-Willard ridge is not among them. Now that wind energy developers are seriously looking at New England’s ridges and hilltops, the debate gets real and it’s on a collision course with conservation. We all want clean energy, independence from fossil fuel and a safe and stable planet to give our children. We all want pristine environments, the wildness that inspires our souls, the calming views, the sense that nothing ever changes. But things do change. And things may change on the Tuttle-Willard ridge. The SEC has done a good job of capturing the pro and con sentiments of Antrim Wind Energy’s proposal. The public record is thick; opinions are strong and plenty. There are expert witnesses, highly qualified locals, well-respected and good, decent folks, all with well-thought-out opinions. There’s not enough space in this newspaper for all the facts and counter-sides of every aspect of the plan. Antrim Wind Energy and its backers differ sharply with opponents on just about all of the issues: aesthetics, noise, shadow flicker, property values, light pollution, wildlife impacts and how it fits with the region’s orderly development. Even the company’s own track record is an issue. Those are all genuine concerns. But as one who has wandered the region’s hills and ridges and has watched – and sometimes participated in – the conservation of our lands, one issue in particular strikes a nerve with me. There’s good reason why the N.H. Fish and Game Department’s Wildlife Action Plan identifies the Tuttle-Willard ridge as the highest ranking habitat type in the state. It’s part of a nearly 13,000-acre block of unfragmented forest. It’s a forest that’s not bisected by roads and development. Science has shown that, for forests and wildlife to be resilient and viable now and into the future, we need large blocks of whole forests, unfragmented by the maze of roads and development that break up so much of the Northeast’s lands. Harvard scientist and Pulitzer prize-winning author Dr. E.O. Wilson has said that the greatest threat to life on Earth comes from habitat fragmentation and invasions of non-native species that find inroads from roads and development. It’s like death by thousand cuts. Protected lands at Tuttle-Willard ridge. The ridge is the unprotected hill in the middle. 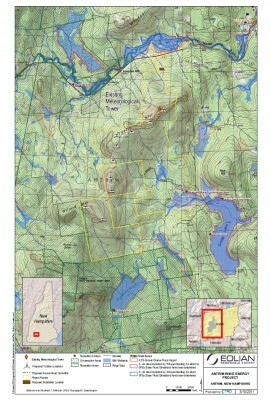 The Tuttle-Willard ridge is the north-western end of a remarkable 12,994-acre unfragmented forest block. It is remarkable for its size, quality and context; nearly one-third of the block is permanently protected land. That’s a testament to the hard work of not just a dozen or so conservation organizations, but also the landowners who’ve wanted to see their lands protected over the past 30-plus years. Among the organizations with nearby protected lands are the Audubon Society of New Hampshire, Society for the Protection of New Hampshire Forests, N.H. Fish and Game Department, The Nature Conservancy and the Harris Center for Conservation Education. 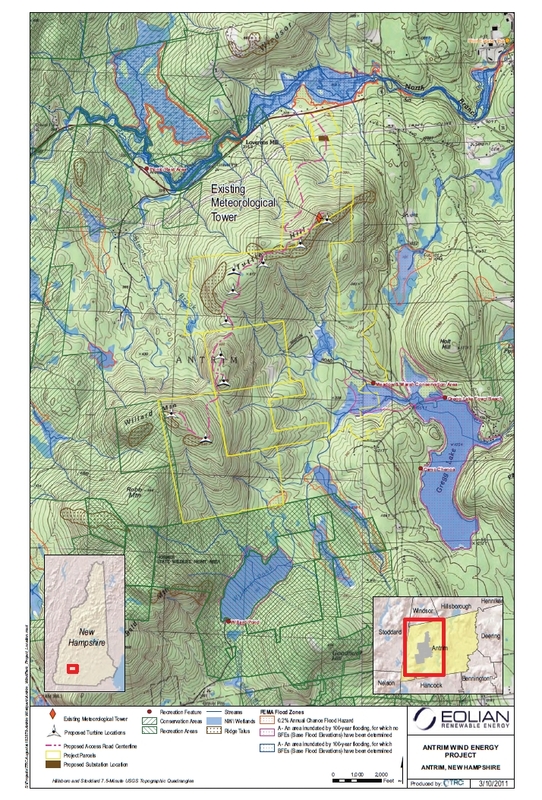 All of these organizations are happy to point out that the Tuttle-Willard ridge lies in the heart of a larger heavily forested area that runs roughly from the Quabbin Reservoir in Massachusetts to Mount Cardigan. Through the Quabbin-to-Cardigan Collaborative, a host of agencies and organizations aim to find sensible ways to protect the high wildlife values of this corridor. For its part, Antrim Wind Energy has offered to add to that base of protected lands if its plan is approved. It has negotiated conservation easements with some of the landowners, covering 808 acres of the 1,800 acres that it would lease. While one of the easements – 123 acres on Willard Mountain – would restrict any ridge-top development, the other four easements allow limited future development, such as a home and ancillary buildings along the ridge. The biggest parcel, 943 acres, has no such agreement for a conservation easement. The prospect of even limited development along that ridge is a major sticking point among opponents, including the Audubon Society, and for good reason. The ridgeline would have the openings and ready infrastructure to develop homes with commanding views, even if those homes were reached by a road other than the turbine access road. Hence the fragmentation. Is wind part of the answer to our need to diversify our energy sources? Yes. Is the Tuttle-Willard ridge the best place for wind power? No. There’s too much at stake. Our insatiable appetite for energy – even clean energy – shouldn’t be a tradeoff for healthy forests and wildlife habitat. We all need it. As the SEC discusses Antrim Wind Energy’s plan next month, the wind will be blowing on Tuttle Hill. Let’s hope the wind keeps blowing through that spruce.